The web hosting market is growing every year. And so the hosting companies always offer best services, wich cheap web hosting plans to gain market. In this article, we will explain why web hosting prices are going down and down every year. The hosting plans prices are going down every month. In the middle 90’s, a cheap web hosting plan used to cost more than 40€ per month. In the ealy 2000’s, this price went down to 10€. 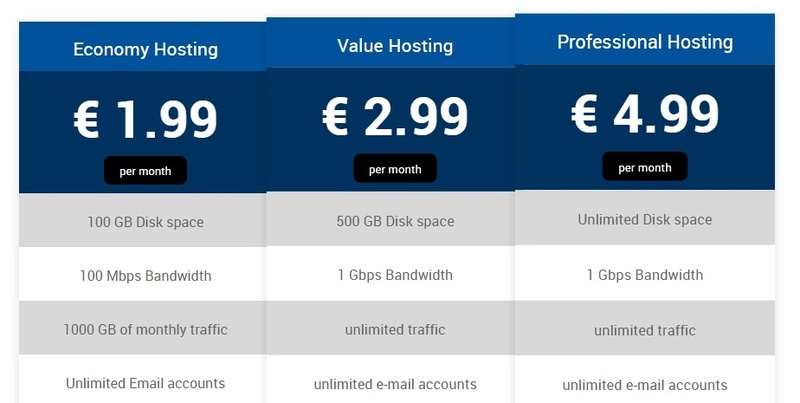 Nowadays, Copahost offers cpanel hosting plans for as low as 1,99€ (Economy Hosting). More powerful servers. Today’s CPU’s are 400% faster than 10 years ago. Cloudlinux, which allows you to control the server resources, protecting each customer from overloads. Many backup possibilities, throught cpanel, phpMyAdmin or R1soft. More powerful servers, more optiomizations. How does it work ? The answer is simple: Cloudlinux. It’s a CentOS based operating system that isolates every website, just like a virtual server. Cloudlinux hosting is being a market standard nowadays. It allows you to control much more the CPU, RAM, IO and processes of the hardware server. A couple years ago, without Cloudlinux, one or two customers could monopolyze the entire CPU sometimes, slowing down the whole server. Nowadays, each hosted website is totally isolated, with its own processes fully controlled. Bigger hosting plans tend to have more % of RAM and CPU. Cloudlinux made it possible to host 200% more websites in a single server, with the very same performance, providing much more stability to the server. This makes the web cheap day by day. With softaculous you can install automatically several applications, like wordpress, joomla, install magento, install mybb and many others. Even without advanted technical knowledge, you can have a great website, like a blog, forum or an online store. Having an autoinstaller saves you time, like technical hours from a technical or a programmer. Any person without technical knowledge can have its blog installed, for instance. Copahost is now offering free ssl certificates with the cheap web hosting plans Value Hosting and Professional Hosting. By ordering a hosting plan, you have access to generate unlimited free ssl certificates, as you wish. Each Free ssl lasts for 3 months, and must be renewed for free from your hosting control panel. Copahost offers several articles and tutorials showing how to generate a free ssl certificate. Considering that a SSL Certificate used to cost more than 50€ per year, having a free SSL option saves you 600€ in 10 years. This new SSL option can be applied to any hosted website in your server, as you wish. Considering you have 10 websites hosted, saving 50€ per year each of them, that’s an economy og 6,000€ in a decade. There is no magic. There are many SSL providers, with their own root-certificates. A root certificate is a “widely known” key by every browser (or at least the most used ones). As a root-certificate owner, the SSL provider can estipulate freely how much they will charge per certificate, or even, simply not charge for them. This market evolution really made web hosting cheap within the last years. Not only the cheap web hosting plans are important to be mentioned. VPS Hosting is also helping the entire market to save money. Just like the shared web hosting plans, the VPS Server plans are lower nowadays. You can order a cheap vps hosting with cpanel for less than 19€. That’s 3,59€ for the VPS Server, plus 15€ for the cPanel license (monthly). The cPanel license for a VPS server, for instance, costs 15€ per month. This price didn’t go down within the last years, but what’s the big deal? VPS Hosting is more and more powerful in the last years. With a hardware node Xeon E5 with more than 128GB of RAM for instance, you can host really crowded VPS Servers with many CPU and IO usage. In other words, a VPS Server in the 2000’s that used to handle, let’s say, 20,000 requests a day, used to cost a lot more. The price was around €100 per month for a VPS Hosting with 512MB of RAM, 1 vCPU and 10GB of disk space. This same task can be done for a budget of less than 20€ today, as the hardware of a VPS is much lower. Full resources control, like CPU usage, processes, aplications, mail queues, etc. You can create a custom branding, with language customizations. This service is similar as a reseller hosting package, but with much more possibilities.